3. Display - 6.21" AMOLED display with an FHD+ resolution, brightness, contrast, color temperature, sRGB coverage, etc. Xiaomi did make a grand celebration of its 8th anniversary at the end of May by introducing three new smartphones, unequivocally named Mi 8, Mi 8 Explorer Edition, and Mi 8 SE. While the Explorer Edition packs all the new and interesting features one would expect to find on Xiaomi's latest flagship and the Mi 8 SE is the lite flagship version with the latest Snapdragon chipset - SD710, the Mi 8 was left somewhere in the middle of not covering all expectations and not offering much more than the Mi 8 SE. It is not an easy task to compete with oneself and Mi 8 is exactly in this position, well sort of. Only the future impartial sales statistics will show whether this is a successful strategy on behalf of Xiaomi. Meanwhile, the Mi 8 is and remains a flagship device that you can have for as little as $500-$550. It brings impeccable build and design, the latest high-end hardware and software features that should turn your experience into a stellar one. Let's delve into the details and see whether expectations are met. 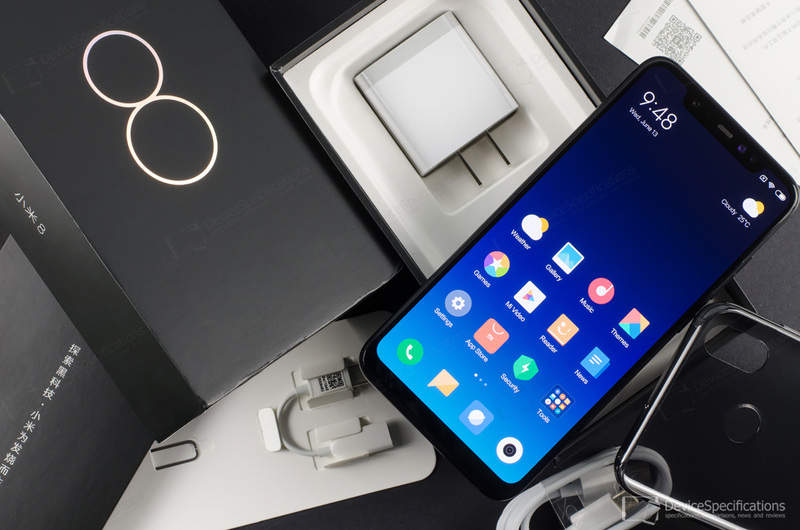 You can get a Xiaomi Mi 8 from Geekbuying with a $6 coupon based on the sale price, if you subscribe to their newsletter from the 6th Anniversary discounts page. Xiaomi Mi 8 is built around a 6.21-inch display with a notch. Its Super AMOLED panel from Samsung offers a peak brightness of 600 cd/m2 and 430 cd/m2 typical brightness, 60000:1 contrast ratio. It has an 18.7:9 aspect ratio, 1080 x 2248 pixels resolution and a pixel density of 402 ppi. The screen supports Always-on Display and HDR10 video content and covers the DCI-P3 colour space. It is protected by a 2.5D curved Corning Gorilla Glass. The in-display fingerprint sensor from Synaptics is preserved for the Mi 8 Explorer Edition. The regular Mi 8 packs a rear-mounted fingerprint sensor from Fingerprint Cards, model FPC1291. The back is covered with glass, too, while in the chassis is made of 7000-series aluminium alloy. Under the glass hood, you will find a Qualcomm Snapdragon 845 mobile platform that houses an octa-core Kryo 385 CPU with four 2.8GHz cores and four 1.8GHz cores. The graphics department is managed by a 710MHz Adreno 630 GPU. These are complemented by a dual-14 bit Spectra 280 ISP, a Hexagon 685 DSP, and a Snapdragon X20 LTE modem. There are 6GB of LPDDR4X RAM clocked at 1866MHz paired with 64GB/128GB/256GB of UFS 2.1 storage. The Mi 8 Explorer Edition has 8GB of RAM. The rear camera department is identical to the one on the Mi MIX 2S and includes the brand-new 12MP Sony IMX363 sensor for the main camera plus an f/1.8 lens and a 12MP Samsung S5K3M3+ sensor for the telephoto camera with an f/2.4 lens. The main shooter is aided by a 4-axis optical image stabilization and Dual Pixel phase detection AF. The front camera is upgraded to the 20-megapixel Samsung S5K3T1 with an f/2.0 lens. There's an IR camera on the front as well that is equipped with an OmniVision OV7251 sensor used for face recognition and unlock. It is accompanied by an infrared emitter. The smartphone has a 3400 mAh battery paired with a 5V/3A~9V/2A~12V/1.5A Quick Charge 3.0 charger. The battery supports Quick Charge 4.0+ and does not support wireless charging. 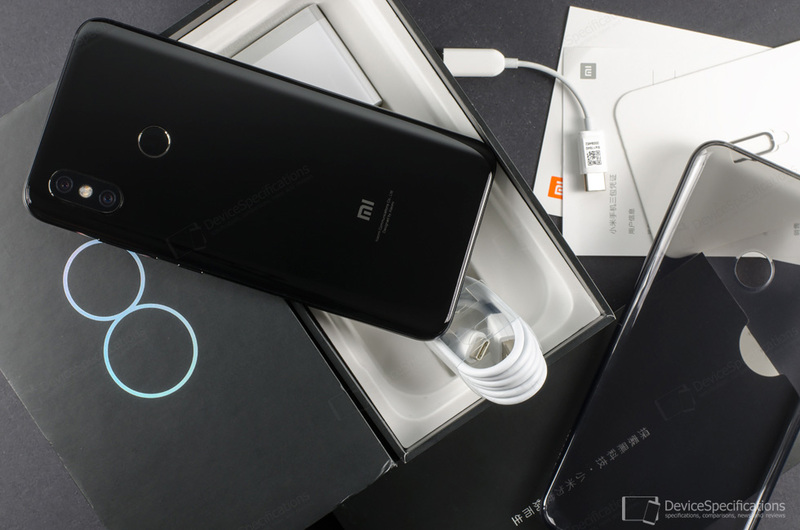 The connectivity options of Mi 8 are quite extensive and include support for Bluetooth 5 with aptX HD, Wi-Fi Hotspot, Wi-Fi Direct, Wi-Fi Display, dual-band Wi-Fi a/b/g/n/ac with 2x2 MU-MiMO, NFC with Android Beam and fingerprint authorized payments, LTE Cat. 18 with 4x4 MIMO, and dual-card VoLTE HD voice. There is a USB Type-C 2.0 with OTG support. The supported network bands include 2G GSM (850, 900, 1800, 1900 MHz), 2.5G CDMA 800 MHz, 3G W-CDMA (850, 900, 1700, 1900, 2100 MHz), 3G TD-SCDMA (1900, 2000 MHz), 4G LTE (700 MHz Class 17, 700 MHz (B12), 800, 850, 900, 1700/2100, 1800, 1900, 2100, 2600 MHz), and LTE-TDD (1900, 2300, 2500, 2600,). The Mi 8 runs on MIUI 9.5 based on Android 8.1 Oreo. Complete Xiaomi Mi 8 specifications.